Make that, Homemade Goat Cheese, (the Chevre version,) Miniature Goat Cheese (err, Chevre) Orbs (marinated or deep-fried! ), and Caramelized Goat Cheese, well, Caramelized Chevre filled Turkish Pide! So, today I’m making cheese; goat cheese; chevre to be exact. Valerie from A Canadian Foodie has challenged a bunch of us to start making cheese from scratch with her Cheesepalooza challenge. I was extremely excited when she announced this challenge, because I’ve always wanted to dabble a little in artisan cheese making. So, it’s a ‘palooza’, but not a lala. The Red Hot Chili Peppers (and this resulted in a million chili recipes on food blogs) will not be performing at this palooza, but they will be making an appearance in my cheese! I’ve made cheese from scratch before; Ricotta and Macarpone. I’ve also made Paneer, but I didn’t blog it, so I do have some cheese-making experience under my too tight belt. However, all three were made with cow’s milk. Does pimento cheese count as cheese making? This time I’m working with goats’ milk (this is actually the proper way to write it. I used to write ‘goat’s’ milk, but according to online sources, it was wrong because it’s singular possessive, as in one particular goat’s milk.) and as mentioned above, making chevre. I love, love, love chevre, but the first recipe provided, from the book Artisan Cheese Making At Home by Mary Karlin , contains something called C20G Powdered Mesophilic Starter. Although I’m 99.9% sure it’s perfectly fine and won’t result in a tree growing out of my ear 20 years down the road, I just didn’t like the sound of it. Mesophilic disease comes to mind. Can’t they call it something like..Me So Making Yummy Cheese from Scratch Stuff? I emailed Valerie about this, and she linked me to a recipe for chevre on her blog that uses buttermilk in lieu of the bacteria/organism laden Mesophilic Disease, umm..Mesophilic stuff. I prefer to keep my food as natural and chemical-free as possible, even in my artery-clogging desserts, SO, as long as I know exactly what’s going into the food I’m making, and it doesn’t have numbers attached to it..it’s all good. Now, don’t get me wrong; this is just how I cook and bake. Believe me, I eat my fair share of foods that contain ingredients with numbers attached to them. Golden Oreo, anyone? Yep, I take care of other people, but occasionally shove Golden Oreos down my gullet at warp speed, not to mention Rice Krispie Treats, Cool Ranch Doritos (Have you ever tried the Cool Ranch Doritos Cheese Chicken casserole? ), Funions, Combos…well, you get the gist. Look, I love ALL cheese, so I’m sure my body is saturated with C20G Powdered Mesophilic Starter, but since I have a choice in this chevre matter..I’m choosing not to use it. Ma added the previous night’s skimmed milk to the cooled milk from the morning milking and put it on the stove to heat. A bit of rennet inside a cloth is soaked in warm water. Once the milk is warm, she squeezes all of the water out of the rennet in the cloth. She adds the rennet water to the milk and stirs it well. The milk mixture is left in a warm place by the stove until it thickens to a quivering mass. The mass was cut with a long knife into cubes. The cubes were allowed to sit until the curb separated from the whey. The curds and whey were placed in a cloth and allowed to drain. When all of the whey was drained, the curds were placed in a pan and salted. The curds were then placed in the cheese hoop to be pressed. And that’s how you make cheese to this day, albeit with a lot more convenience, electricity, modern appliances, and better clothes. So I made the cheese using goats’ milk, buttermilk (which actually contains the Mesophilic stuff, a little fact alerted to me by a reader, but I just felt better using buttermilk; it’s a mind issue) and a rennet tablet crushed with some water. It turned out fantastic. I wanted to blow this whole post off and eat it all with a spoon. Have you ever made yogurt cheese? It’s called Labneh, and you can make the same recipe below using labneh. Marinated Labneh balls! Yum! Well, essentially, once the goats’ milk has formed into a jelly like mass, you do the same thing you’d do when making yogurt cheese (aka labneh) as linked above. You wrap up the milk jelly (I cut mine into pieces) in cheesecloth, tie it up tight, and let the whey drain over a strainer into a bowl, overnight. Upon baking, I realized I didn’t pinch the ends together correctly. They should look like THIS. The next morning I had creamy, dreamy chevre! I got about 16 ounces of cheese, so, after eating a few spoonfuls (uhh..4 ounces), I added red hot chile pepper flakes, herbs, garlic, and lemon zest to the rest of it, rolling them into cheeseballs (I love cheeseballs as one word because it tickles the kid in me, but a friend started calling them Goat CHEESEORBS, and I LIKE IT!) and packing them into ball jars with a light olive oil and more herbs. I used the other half of my spicy chevre as a filling for a Turkish bread called Pide. Pide – Pizza – Pita..you know, flatbread in any language. I cut the pide to resemble pizza slices. I kind of wish I cut it the way it’s supposed to cut; like THIS. Much prettier. But, I love how the chevre caramelized; it gave it a whole new and amazing flavor, one that I want to experiment with. Who knows, caramelized cheese could be a new ‘thing’?!? 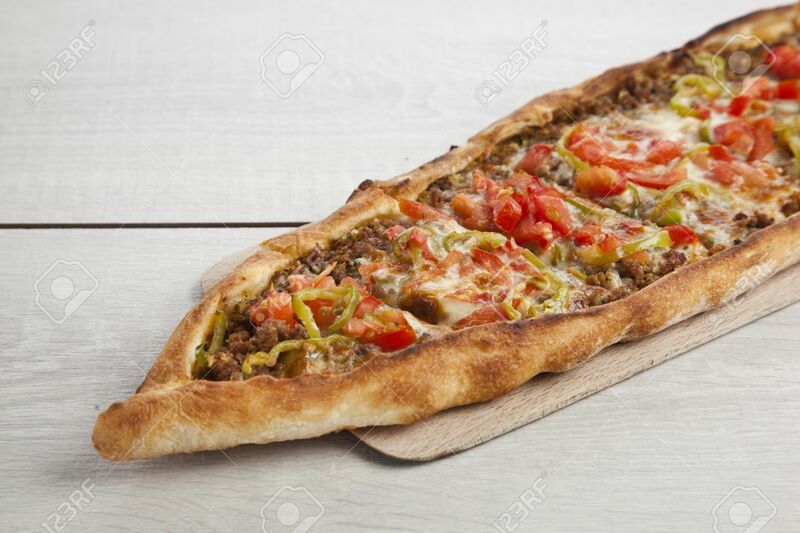 In fact, the photo of the pide straight from the oven kind of looks like a female body part, doesn’t it? Sometimes my photos are just gross, but hey, one day I will have natural light, and when I do, they’ll look less like discolored female body parts. I hope. In conclusion, be adventurous and make cheese! Then make cheeseballs CheeseORBS! Then make pide..or just grab a huge spoon and eat cheese; cheese that YOU made from scratch; fresh, creamy cheese straight from YOUR kitchen! It beats paying mucho dinero for a half pound of it, you know? If you have a moment, head on over to Valerie’s blog to see the chevre round-up, HERE. You’ll be amazed and inspired, and hopefully it will inspire you enough make some yourself and/or take part in some of the Cheesepalooza challenges! without C20G Powdered Mesophilic Starter! If you're making the homemade chevre, naturally the prep and cook time listed will increase according to chevre directions linked above. Prep time does not include the chill time if you're making the deep-fried goat cheese orbs. Spicy Garlic Herb Chevre (or Feta *) - For cheeseballs and/or pide filling. 12 ounces fresh chevre. Cut chevre with cream cheese if you like, 6 oz each, or use all cream cheese, if you prefer, or make and use yogurt cheese aka labneh! Extra herbs for olive oil marinade for cheeseballs, Pack 'em in for even more flavor! In a medium bowl combine all the garlic herb chevre ingredients thoroughly. Set aside, covered at room temperature to let the flavors blend while you make the dough. If you just want to make the soft cheeseballs in olive oil, refrigerate the cheese mixture until firm, covered, about 30 minutes, then roll into balls, about 1 to 2 inches in diameter and pack into jars with olive oil. Stuff more herbs of your choice and add extra red hot chile pepper flakes into the oil around the cheeseballs or cubes of feta *. and seal or cover tightly if using a bowl. Tap sealed jars on the counter to remove any air bubbles. I used 8 ounce ball jars. The cheese balls in olive oil will keep for a month in the refrigerator. Let come to room temperature for about an hour or more before serving. In a medium bowl combine all the garlic herb chevre ingredients except the oil, thoroughly. Cover the bowl and put in the fridge for about an hour. While chilling, prepare your breading station. The flour, the beaten egg, and the panko bread crumbs. Remove goat cheese mixture from fridge, and roll into about 25 to 30 balls (about a tablespoon of the cheese should get you that). Roll each ball in the flour, then the beaten egg, then the panko breadcrumbs. Place them on a parchment lined baking sheet as you bread them. When done, place the baking sheet with the breaded cheese orbs inthe fridge for about an hour, or the freezer for about 30 minutes. Heat about 3 inches of oil in a deep pot, to 350 degrees F. When it comes to temperature, remove the breaded goat cheese orbs from the fridge or freezer and deep fry two or three at a time, as you don't want to crowd the pot or skillet. Fry for about 1 or 2 minutes, or until golden brown on all sides. Remove and drain on a paper towel lined fine mesh rack over a baking sheet. Serve immediately. *You can use my olive oil marinade to make marinated feta cheese cubes or yogurt cheese orbs (labneh), too! If using cubes of feta, infuse the olive oil with herbs and red pepper flakes (meaning add all to the olive oil prior to adding the feta cubes), then add the feta cubes and marinate in jars or a tightly wrapped bowl. In a medium bowl combine all the garlic herb chevre ingredients thoroughly. Set aside, covered at room temperature to let the flavors blend while you make the dough. Dissolve the yeast with the sugar in ¼ cup lukewarm water until foamy, then mix with the flour, salt, oil , yogurt, and remaining ½ cup water. Knead to a smooth dough, adding more flour or water, if needed. Place the dough in a lightly greased bowl, cover with plastic wrap and let rise for one hour or until doubled. Gently punch down dough by folding it over itself. On a floured board, divide the dough into two equal pieces. Cover with a tea towel and let rest for a few minutes to relax the gluten. Preheat the oven to 425 degrees F - Remove the top rack. You will be using the rack on the middle shelf. While working with one piece of dough, keep other covered. Roll the piece nto an oval..about 14 inches by 10 inches. Place dough on a parchment lines baking sheet. Alternatively, you can use a pizza peel and baking stone, which will give you a slightly crisper bread, but either way is fine. Spread half the goat cheese mixture (6 ounces) down the center, leaving about 2 to 3 inches on each side. Fold each side of the dough toward the middle, sealing and tapering the ends so you have a slipper looking flatbread with some of the filling showing down the center (see photos above). Drizzle a little olive oil over the top of the cheese so it caramelizes. Bake flatbread about 20 to 30 minutes, until golden brown and the cheese is bubbly and slightly brown and caramelized. Quickly remove bread from baking sheet to a wire rack to cool for a few minutes before slicing. Repeat all the above with second ball of dough and remaining 6 ounces of cheese. I’m submitting this Turkish Pide with Caramelized Chevre to this month’s #TwelveLoaves theme – cheese, hosted by Lora of Cake Duchess, and to Yeastspotting hosted by Susan of Wild Yeast. This entry was posted in Appetizers, Breads, Middle Eastern, Twelve Loaves, Vegetarian, Yeastspotting and tagged baking, caramelized goat cheese, cheese balls, Cheese Orbs, cheese pide, cheeseballs, Cheeseorbs, Chevre, Dough, Finger Food, flatbread, garlic, goat cheese, Goat Cheese ORBS, Herbs, homemade cheese, Pide, red pepper flakes, Turkish Flatbread, Turkish pide. Bookmark the permalink. This post is wonderfully written. I enjoyed reading it very much.Totally lovely! I would love to make my own cheese. I need to do some more research on it and prepare it properly. Nice cliffhanger! Aw, it’s going to be so weird when your Dreamboat series finishes. Do you have any more stories up your sleeve? The chevre looks incredible! I love the photo with the drop of oil. Those cheeseballs look gorgeous and very tasty! Wow, I´m so crazy about chevre, and never ever thought of making some of my own. I have to hunt down goat´s milk. Amazing! but then I read the recipe and I love it even more. I never knew making chevre was that easy! The chèvre is incredible my friend, looks too yum! And gooood I’m dying I can’t believe the finale is that close! What are we going to do when your story finishes!!! Again Lisa, You are so ambitious…joining yet another food challenge and making cheese! I would love nothing more but to dip my fingers into that jar and sample a cheeseball! After you publish your novel you need to publish your gourmet cookbook:) You WOW me every time! I need the next part already! That’s a crazy cliffhanger… And I’m drooling over the cheese and bread. i first had ‘olive oil and herbs cheese’ when i was in france-the alps-20 years ago. thanks for giving us an easier way to do it! Hi Lisa, your goat’s cheese balls look delicious, and your photography is amazing! I hate to break it to you but buttermilk contains the same bacteria as the starter cultures, it’s just buttermilk is in liquid form and the ones used in the book are freeze dried. I used one called Flora Danica, sounds much nicer doesn’t it?! But essentially they’re all the same! I sometimes use natural yoghurt too, as that has an effective starter culture as long as it’s live. What? A proposal? Can’t wait to read that last installment. I admire your cheese making fortitude as I’ve been too intimidated to try. Really like the buttermilk substitution on this delicious result I would have balked too. I just returned from Turkey two days ago. This pida made me ant to go back. I miss the food. I have been making goat cheese this summer, but I can’t believe how expensive the milk is. I found out that my grocer drops it to a buck a half gallon a week before expiration, so I have been making it about every 6 weeks! I love those balls in oil, and that bread…..we dive in with a drizzle of honey and fresh ground black pepper…and crusty bread. You know I love this love story…. Goat cheese one of my favorites especially with a french baguette. Love the additional flavors you created as well as your own breads…very yummy. Your photos are great and love the cheese ball that is moist and dripping. Thanks for leaving us hanging once again with your story :). I’ve got to make it!! And once I do – we certainly gonna eat it with pita-bread. And wow…. Another part; you’re just doing it on purpose don’t you? I want to know how it ends!!! I have always wanted to make cheese (other than ricotta) at home, but since I came to Katmandu and now that I have more spare time for that, the milk here will not turn into cheese, I will have to try it when I go back to Brazil. Your Chevre looks divine!! Hi Lisa, I just read your comment, and left a reply for you on my blog. ‘Great minds think alike’ …what a coincidence. Late last nite, I pinned your beautiful jar of the cheeseballs in the jars, and had no idea that it originated from you. I love, love, the method of making the awesome cheese, and the flatbread is gorgeous. I want to read your post story, which sounds so cute and romantic/funny, but now, I must take my car in for a ‘oil change appt’…come to think of it, maybe not now…it’s pouring rain! Huge props for making your own chevre! I’m still so afraid to do that myself, but one day..
And yay! The 7 makes another appearance! I have a small bit of chevre left from my batch… I’m so jealous of your cheese balls in olive oil that I may have to take that bit of inspiration from you! Wow, wow, wow Lisa. This project sounds so fun. i have to check it out. You made goat cheese? Too cool! l0ok amazing. Oh you are sucha tease with that ending! Although I have a feeling abotu what part 18 will say. The hurt and pain part…seems to be the normal at any age. Ok Lisa, the story telling cheese making goddess- Im up for a challenge. Booya! Lets make cheese! Why? Because I love cheese and have not been brave enough to try and two because Im sick of visiting money lenders and loan sharks every time I stock up on GOOD cheese. Um where in the world do I get rennet? LOL@ the loanshark barb. Yep..the good artisan cheeses can be quite pricey! For like 10 bucks..you can make a ton of your own that’s just as good or better! This project not only sounds fun, but you’ve made everything soooo drool-worthy!!! It is so cool you made your own cheese! This is something I have never tried it yet, but want to! And the flatbread what can I say, it looks absolutely finger licking! I can’t believe you made chevre!!! Marvelous!!! I stopped after ricotta 🙂 And those cheeseballs look fantastic, Lisa. OK, hurry up and post Part 18!!!! I’m so hungry right now! I’m so glad part 17 isn’t the end! I’ll be sad when part 18 is, but I’m sure you have lots of stories to entertain us with..all writers do! Love the cheeseballs and flatbread..amazing that you made it from scratch..very ambitious!! Ohhhh making cheese is so much fun! I also made Ricotta and Mascarpone before, but never tried to make my own chevre yet. The pastry also looks really yummmmmy, wtg! omg Lisa!! I’ve never made cheese before in my life and I’m so inspired right now! WOW You are seriously so amazing!!! I’m going to look at your mascarpone and ricotta now. hehe..
What am I going to do when this is over?! You will have to start another one. 🙂 Love the flatbread with the great flavors of the chevre. There is a special satisfaction you get when you make everything from scratch, so I am sure this recipe was very rewarding to put together. It looks great! Chèvre!! Favorite cheese! As if I don’t have enough on my monthly blog plate, I seriously think I need to make cheese. I’m a cheese addict and would love to learn how to make my own from scratch. Headed over to check out Cheesepalooza as soon as I’m done typing this. I’ve made ricotta before but that’s it so I can’t wait to see what I’ll learn! And I can’t believe this story is coming to an end! I look forward to each and every post you publish but the ones with your bad boy love story are always extra special. You are an incredible writer and have me hanging on each and every word. Can’t wait to read the finale yet I don’t want it to end. And now you are making your own cheese, too? And of course, not just goat cheese! No, not you! Spicy Garlic Herb Chevre!!! Wowee I want some of this. It looks amazing! And professional! 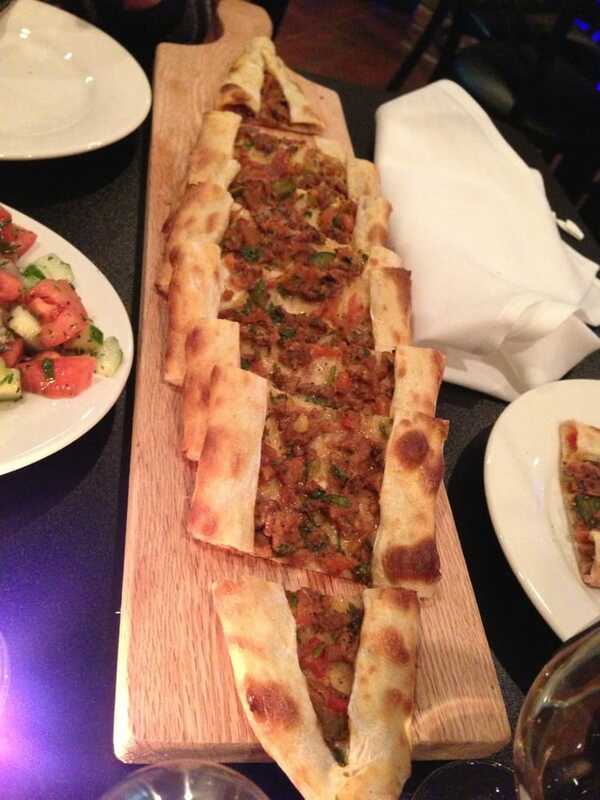 And the filled turkish bread, I want to come and live with you so we can eat all this happily, side by side. Stunning, Lisa, all of it. You never ever fail to impress me even when I expect greatness. And the story…. I have nothing left to say. I am riveted! Oh my goodness, I’ve been so out of the loop, I only saw that you wrote part 17 just now! And you made cheese????!!! This is a great post!! Lisa you seriously have to write a book 😉 Can’t wait for the finale! Thank you, Sue! It was all amazing 🙂 Hope you try them! Has anyone actually made these? I would love to know how they taste in your opinion. I am looking for a fun gift to give to friends this year and I love the look of these!